Restoration is beautiful. 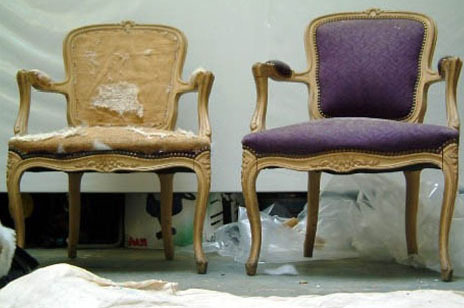 Whether you are talking about artwork, furniture, automobiles, or people, restoration is a wonderful and beautiful thing. Here are some great verses from James 5. 19 My brothers, if any among you strays from the truth, and someone turns him back, 20 let him know that whoever turns a sinner from the error of his way will save his life from death and cover a multitude of sins. Notice that in these last two verses of his letter, James shows compassion for those who have strayed from the truth. He reminds the “brothers” that if some from their fellowship wander away from God, the rest of the church should not turn their backs on them. They should seek to restore them to strong faith in God and restored fellowship with the church family. When someone strays from the truth, why is it a temptation to distance yourself from them rather than to reach out to them? Additionally, notice that the Bible says, “if any among you….” This reminds us that we are all susceptible to the temptations of the devil. Satan wants to lead us all astray. So we should all be on our guard, depending on the Lord to help us when we are tempted. God wants you to be strong and faithful every time. He helps you! 12 So, whoever thinks he stands must be careful not to fall. 13 No temptation has overtaken you except what is common to humanity. God is faithful, and He will not allow you to be tempted beyond what you are able, but with the temptation He will also provide a way of escape so that you are able to bear it. If you remember that we are all susceptible to temptations, how does that help you in your attitude, words and actions as you reach out to others? What do you learn from 1 Corinthians 10:12-13 that can help you as you seek to help others to be restored to strong faith in Christ and fellowship with other believers? James 5:19 says, “if any among you strays from the truth” (emphasis added). The truth is the word of God. Throughout his letter, James describes many ways that a person could be straying from the truth. Take a moment to scan James chapters 1-5 to see a few of these ways. Grab your Bible or read it online HERE. List at least five things that James chapters 1-5 teach us about how our actions, words, and attitudes need to be in line with God’s truth. Why is it essential that we continually be reading God’s Word and studying it ourselves to remind ourselves of God’s truths? It is important to remember that everyone is to be about the business of restoration. James says, “whoever turns a sinner from the error of his way…” (James 5:20). Whoever. It’s not just the job of the pastors or leaders of the church. It’s every Christ-follower’s responsibility. It’s NOT our job to be judgmental, condemning, or hateful, but it is our job to be loving, concerned, and caring toward those who have strayed from the Lord. Why is it important for us to remember that the ministry of restoration is everyone’s responsibility, not just the pastors’ or church leaders’ responsibility? Pray for the person to be restored to strong faith in Jesus Christ (read James 5:13-18). Examine your own life before you even consider approaching the person who has strayed (read Matthew 7:1-5 and Galatians 6:1-5). Make sure that your words, your actions, and your attitudes are in line with Christ. Reach out in love and compassion (read 1 Corinthians 13:1-13). Give them a call, send them a message, invite them for a cup of coffee, or reach out in a number of ways. Think about and discuss these principles and verses. How can you put them into practice? The aim of our ministry of restoration is that the person will turn away from sin and return to walking with Christ (see James 5:20). We pray that the person who has strayed will see how damaging sin is. Your reaching out to them can help them to avoid future pain that sin would cause. The direct effect of sinful behavior sometimes leads to untimely physical death (for instance, drugs and alcohol can lead to untimely deaths). And even if the sin doesn’t lead to instant physical death, it may lead to death of relationships, death of emotions, or more. For the unbeliever, sin not only leads to physical death, but it results in spiritual death for all of eternity (see Romans 6:23). We pray that when we reach out to them, they will turn back to Christ and walk in the new way of life, the way of abundant life in Christ. They will be “saved from death” and will receive healing that covers over “a multitude of sins” (see James 5:20). Our ministry of restoration echoes the words of Jesus in John 10:10. 10 A thief comes only to steal and to kill and to destroy. I have come so that they may have life and have it in abundance. God wants each person to live an abundant life in Christ! Is there anyone that the Lord is leading you to reach out to? Perhaps this message has encouraged you to be restored back to a closer walk with Christ. If so, what steps will you take this week? Why Was The Man Born Blind? The topic of restoration is an excellent focus for those of us who work in the prison ministry. The inmates are broken and in need of the Lord. Those who come to Bible study begin their journey of restoration. it’s been my experience that it takes time and a consistent witness on our part to develop trust and to empower them with the ABC’s of salvation so they can explain it to others.